The State owns two major tracts of public land in eastern Cumberland County, both within 40 minutes of Maine’s two largest urban areas – Pineland Public Reserved Land (600 acres) and Bradbury Mountain State Park (800 acres). 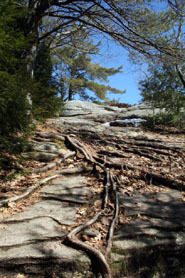 These two resources are located only three miles apart, and the trail corridor and park expansion created to link them with the support of the Land for Maine’s Future program offers a remarkable recreational opportunity–providing an accessible trail network (portions of which are open to mountain biking, horseback riding, hiking, trail running and snowmobiling). Bradbury Mountain is the only state park in Cumberland County to allow all these uses, and its day use has increased by more than 350 percent over the past two decades. The Land for Maine’s Future (LMF) program fund several acquisitions along the 13-mile trail corridor. Other partners of the trail corridor include the Casco Bay Estuary Project Habitat Protection Fund, the Royal River Conservation Trust, and the New England Mountain Bike Association. Additional conservation projects by the Royal River Conservation Trust and the Town of Pownal provide additional contiguous conservation context buffering the trail corridor and protecting spur trails including important snowmobile trail sections. The eastern end of the corridor begins on 485-foot Bradbury Mountain with trailhead parking at the Route 9 park entrance. Bradbury offers excellent views of the coast and extensive trail networks for mountain bikes and others. Wabanakis once camped on this mountain, and the first European settlers in the early 1800s built terraces on the mountainside to cultivate grapes. Moving west, the trail traverses Tryon Mountain, the site of an historic feldspar mine and one of the region’s largest deer-wintering areas, with a trailhead parking area on Pownal’s Lawrence Road. In this section, the trail crosses Chandler and Thoits brooks, going past a beautiful waterfall. Trail connections along a CMP powerline extend the trail to Pineland Public Reserve land in North Yarmouth and Gray, where trail construction in 2013 connects the full corridor to a trail head on Depot Road in Gray. Trails continue from the Depot Road to the banks of the Royal River in Gray.The trail corridor benefits wildlife as well as recreational users, providing an important greenbelt in an area that is experiencing sprawl and habitat fragmentation. Hunting is allowed along some stretches of the trail corridor. Please respect posted rules for all uses. DeLorme Maine Atlas and Gazetteer Map 5, C-5. From Pownal Center, take Route 9 north and turn left into the park after approximately .5 miles. 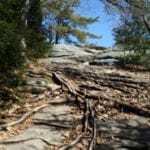 Camping reservations for Bradbury Mountain State Park can be made online. To reach the Pineland entrance, go west on Elmwood Road, turning left at the end onto Allen Road. Just after the intersection with Route 231, the Pineland Center will be on your right.